Create a fuller, healthier-looking head of hair with Nourkrin Man, an award-winning hair loss supplement that combats thinning and receding. 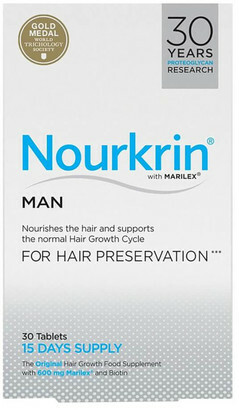 When the Hair Growth Cycle is disrupted by factors such as stress, medication and cholesterol, the Nourkrin tablets help to restore a normal cycle to encourage healthy hair growth. Exclusive ingredient MarilexÂ® strengthens strands from root to tip, working to reduce breakage and fall out while replenishing elasticity and shine. After six months, hair is noticeably thicker and revitalised.